The process, more than the content or the result, is especially exciting for you. You are energized by the steady and deliberate journey from ignorance to competence. The thrill of the first few facts, the early efforts to recite or practice what you have learned, the growing confidence of a skill mastered -- this is the process that entices you. Your excitement leads you to engage in adult learning experiences -- yoga or piano lessons or graduate classes. It enables you to thrive in dynamic work environments where you are asked to take on short project assignments and are expected to learn a lot about the new subject matter in a short period of time and then move on to the next one. Honor your desire to learn. If you can't fulfill this need at work, take advantage of the adult educational opportunities in your community. Discipline yourself to sign up for at least one new academic or adult learning course each year. Be a catalyst for change. Others might be intimidated by new rules, new skills, or new circumstances. Your willingness to soak up this "newness" can calm their fears and spur them to engage. Take this responsibility seriously. 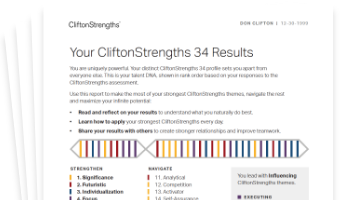 See how Learner shows in your CliftonStrengths results -- discover All 34 CliftonStrengths Themes today!